Mashed and pan-fried or baked chickpeas, also known as garbanzo beans, make a delicious veggie burger. This recipe is for 4 burger patties and takes only 20 minutes to make. Heat 1 Tbs of oil and sauté the onions over medium heat, stirring frequently, until they soften, about 5 minutes. Add the garlic, cumin, and carrot and sauté for two more minutes. Transfer to large bowl or food processor and add the chickpeas. Mash or process until mushy. Stir in tahini and parsley. Combine the flour, flax, and salt in the small bowl, then stir into chickpeas. Flour your hands, shape mixture into four patties, and dust them with touch more flour. Pan fry in 1 Tbs coconut oil over medium-low heat for 1 minute, until just beginning to brown. Flip, fry 2 minutes, flip again, and cook one minute (2 minutes total per side). Splash with a bit of lemon juice and serve. These are wonderful on sprouted grain bun or along with salad. Your burger looks great! 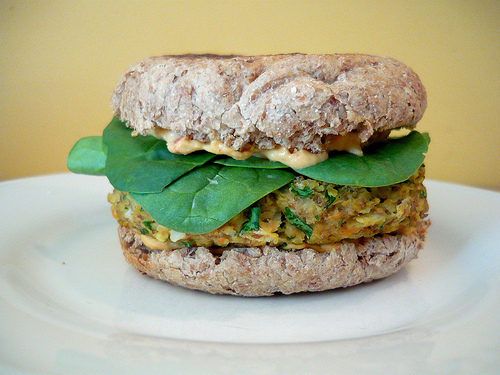 I have posted a link to your recipe under my own recipe for chickpea burgers, do take a look when you have a chance. I have also recently published a cookbook of healthy Indian food.